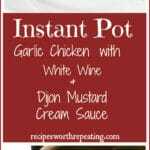 This Instant Pot Garlic Chicken with White Wine & Dijon Mustard Cream Sauce is made in your Instant Pot and is utterly delicious, easy and FAST! Chicken thighs seasoned with smoked Paprika and fresh thyme then drizzled with a luscious white wine sauce with a creamy Dijon mustard! Instant Pot recipes are SUPER convenient! I thank my lucky stars each day that I purchased my Instant Pot months ago! I couldn’t live without it! I use it ALL THE TIME! 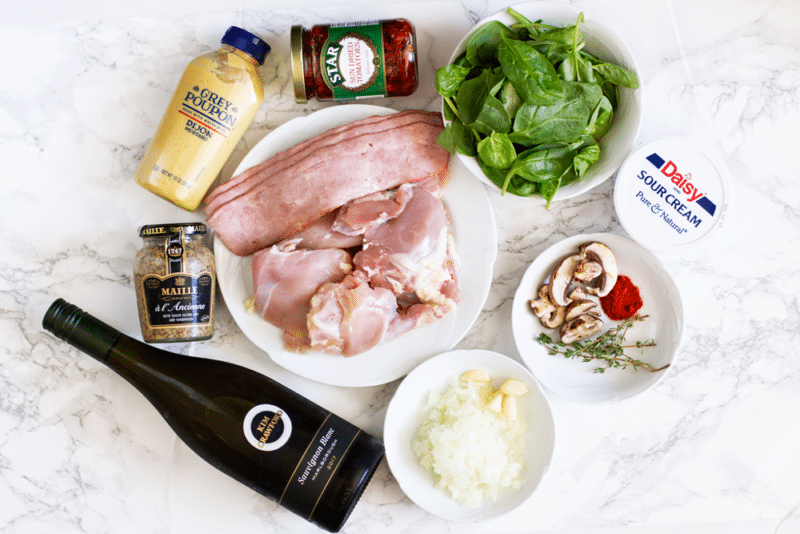 And this Instant Pot Garlic Chicken with White Wine & Dijon Mustard Cream Sauce…oh man…. Literally – I make so many recipes in my Instant Pot and it saves me a ton of time! About a year ago when I was traveling in England, a fellow food blogger friend, Erin from over at Platings and Pairings, posted a recipe for One Skillet Chicken with White Wine and Mustard Cream Sauce. From the moment I saw this recipe, I knew I wanted to try it. This is the first recipe I made when I got back to the states. And like you can probably imagine, it turned out so unbelievably amazing! But, I wanted to switch it up. I wanted to make it in my Instant Pot. So let’s start with the ingredients and I’ll walk you through each step on how to make this yumminess! 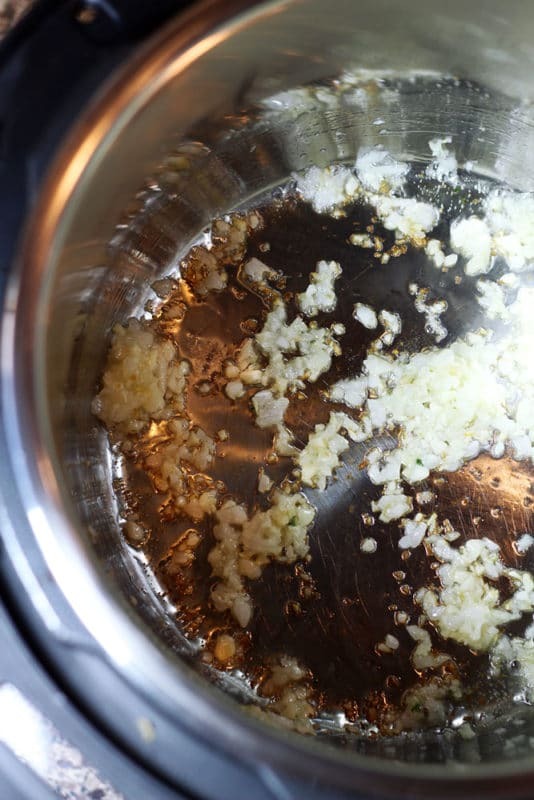 First, I add olive oil to my Instant Pot and sauté the minced garlic. Next, I chop up the turkey bacon and add in the Smoked Paprika and onions and sauté for a couple of minutes. Ya’ll, my kitchen smells ridiculously amazing during this sauté process! Love the smell of sautéed garlic, onion and bacon! Gosh, I love BACON! It’s one of my favorite combos! Next, I add the chicken thighs on top of the garlic, onions and bacon and I sauté until each side is lightly browned, turning over once to sauté each side of the chicken. 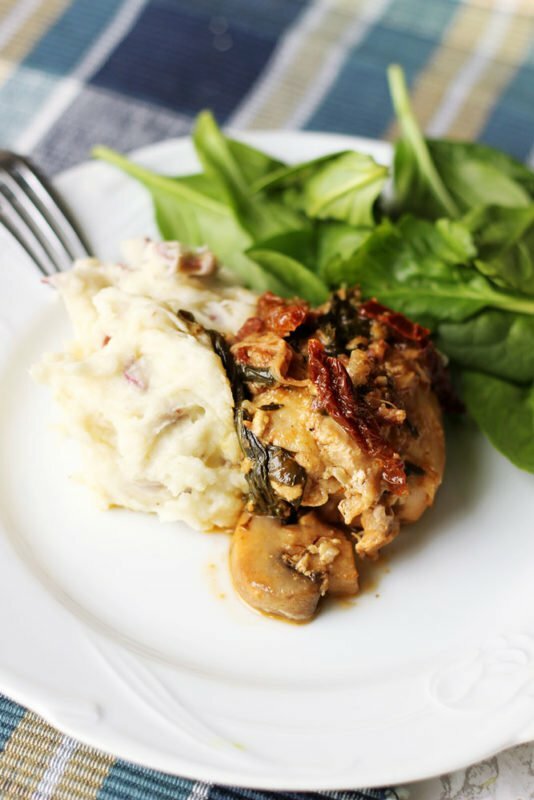 I then add in the fresh mushrooms, fresh spinach and sun dried tomatoes on top of the sautéed chicken thighs and continue to let the Instant Pot saute the ingredients for just a few minutes. While the ingredients are in the Instant Pot, I combine the Dijon Mustard, sour cream and whole grain mustard in a separate bowl. 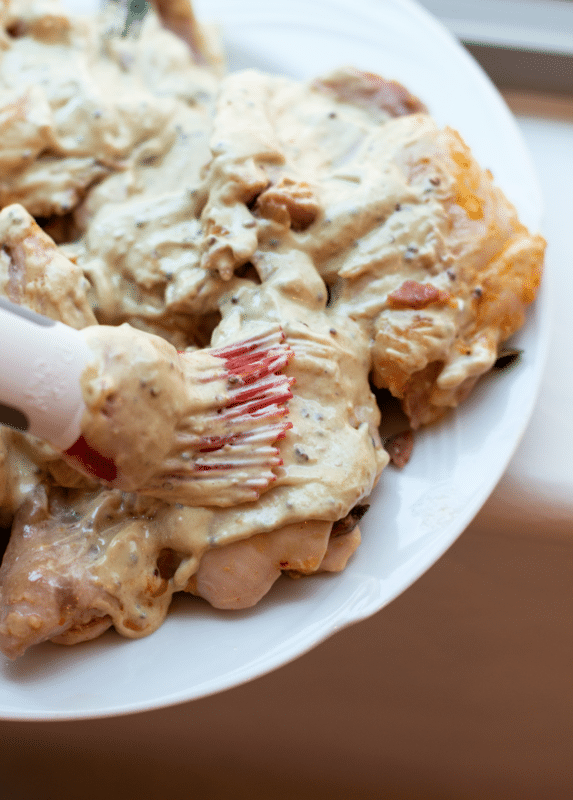 Remove the chicken from the Instant Pot and take a basting brush and coat the chicken thighs in the creamy Dijon Mustard cream sauce. This is one of the BEST and most savory sauces! The flavor combination is intense…in a REALLY good way! After I’m done putting on the marinade, I place each chicken thigh back into the Instant Pot. Then, I pour in the white wine and place the thyme springs in the Instant Pot. From there, I close the lid to seal. The Instant Pot does its magic from here. 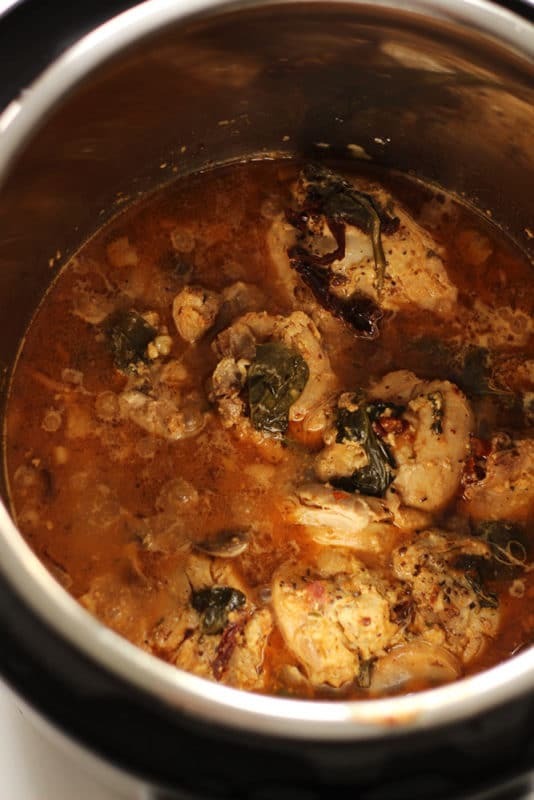 I set my Instant Pot to the Poultry setting and after a few minutes it started to lightly steam and my kitchen continued to fill with the most delicious aroma of garlic and dijon chicken. After the cooking time, I released the pressure and let it depressurize naturally. Once the depressurizing was completely done, my Instant Pot Garlic Chicken with White Wine & Dijon Mustard Cream Sauce is done! This Instant Pot Garlic Chicken with White Wine & Dijon Mustard Cream Sauce is so easy to make, full of flavor and gluten free! The other thing I love about this recipe is it’s versatility! It’s that simple, my friends! Your Instant Pot will become your best friend because it does all the hard work and makes your food taste so amazing!! Here’s some tips for making this the best meal ever! If you like a thicker sauce, add a little bit of arrowroot or cornstarch to this garlic chicken dish after it’s done to thicken up the Dijon Mustard cream sauce. If you want to thicken things up a little, add in 1 Tablespoon or arrowroot or cornstarch and set the Instant Pot to sauté mode. Let the sauce boil a little until it thickens to your liking. 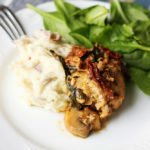 When I serve this chicken, I love to pour a Tablespoon of the Dijon Mustard sauce over the chicken and top it with the cooked mushrooms, spinach and sun dried tomatoes. YUM! If you serve this Instant Pot Garlic Chicken with White Wine & Dijon Mustard Cream Sauce with rice or mashed potatoes, don’t forget to add a bit of the Dijon Mustard cream sauce on top of those side dishes! It makes the flavor POP even more! 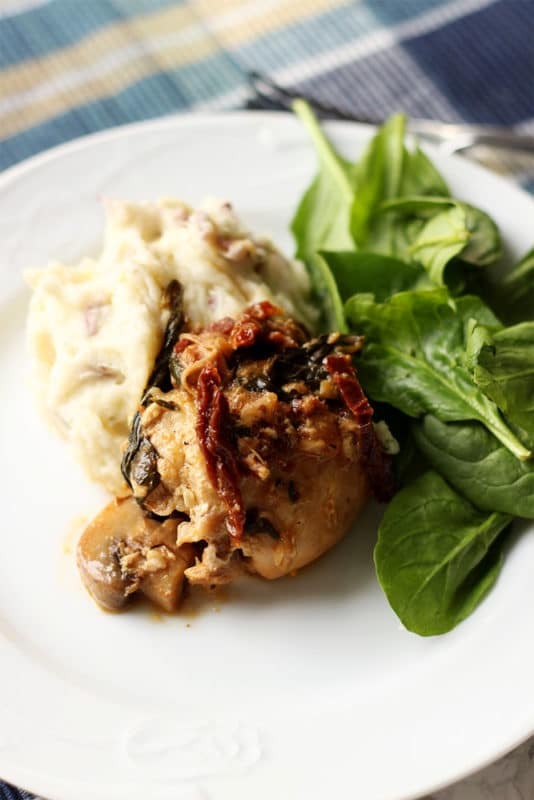 Love serving a fresh spinach salad with this Instant Pot Garlic Chicken meal! This Orange Walnut Salad with Sweet and Sour Dressing pairs perfectly with this dish! Oh, and if you want my recipe for mashed potatoes, check out my Perfect Homemade Mashed Potatoes…they are a classic and a favorite by my family. 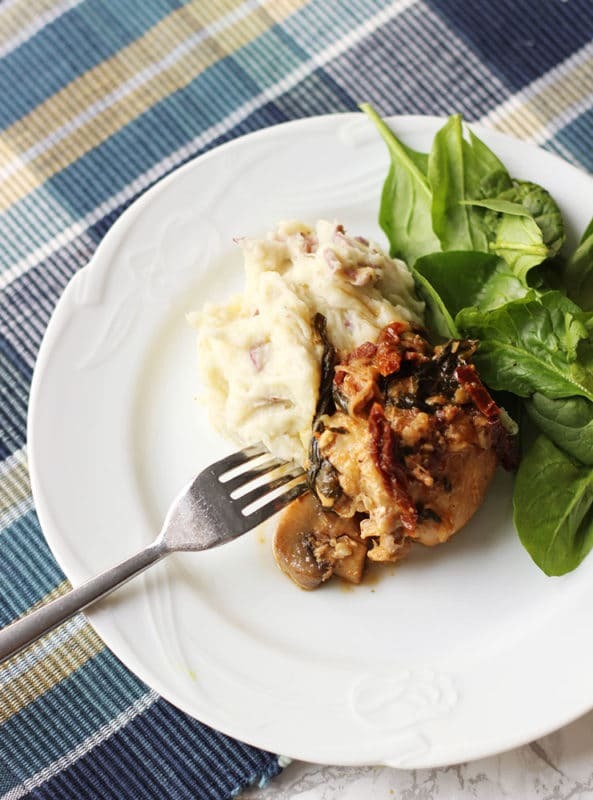 I often serve these mashed potatoes when catering and I always get reve reviews! My Ono Rice recipe is also really good with this dish. What Other Instant Pot Meals Can I Make? I just know you are going to love this Garlic and Dijon Chicken dish and these easy step-by-step instructions! If you’ve tried this or any other recipe on the blog, then don’t forget to rate the recipe and let me know how it turned out in the comments below! I love hearing from you! You can also sign up for my newsletter and FOLLOW ME on FACEBOOK, TWITTER, INSTAGRAM and PINTEREST to see more delicious food I’m creating! This Instant Pot Chicken with White Wine & Dijon Mustard Cream Sauce is sure to become a repeat on your dinner menu! This one is made in your Instant Pot and is utterly delicious, easy and FAST! Chicken breasts are seasoned with smoked Paprika and fresh thyme then drizzled with a luscious white wine sauce with a creamy Dijon mustard! Set your Instant Pot to Saute mode. After the Instant Pot gets hot, pour in 1 Tablespoon of olive oil. Add the chopped garlic and onions to the Instant Pot and saute for 2-3 minutes. 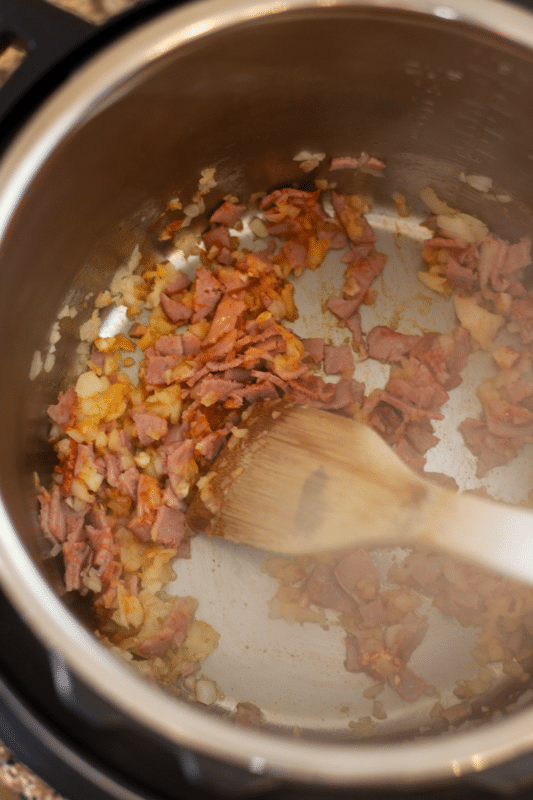 Chop the bacon and add the bacon and the Paprika to the Instant Pot and saute with the garlic and onions for 1 minute. Add the chicken thighs to the Instant Pot and saute until each side is lightly browned, turning over once to saute each side. 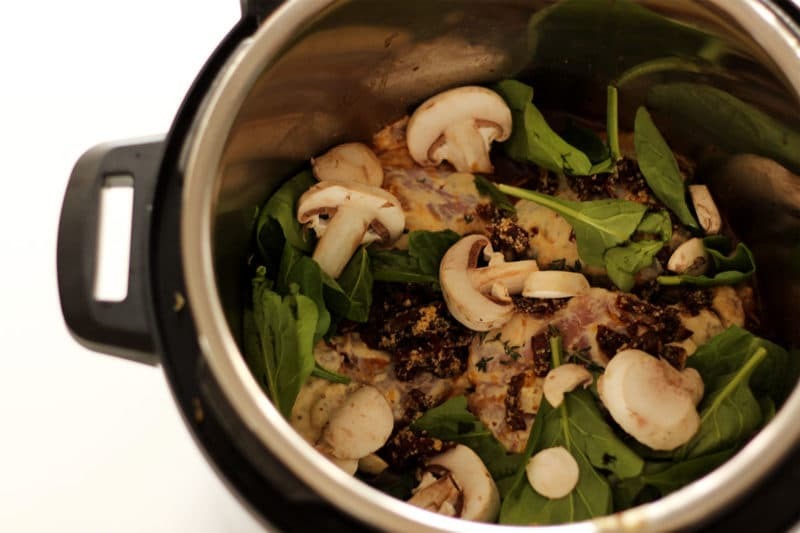 Next, add in the fresh mushrooms, fresh spinach and sun dried tomatoes on top of the seared chicken thighs and continue to let the Instant Pot saute the ingredients. In a bowl, combine the Dijon mustard, sour cream and whole grain mustard. Remove the chicken from the Instant Pot and take a basting brush and coat the chicken thighs in the creamy Dijon Mustard cream sauce. Pour the white wine into the Instant pot and stir ingredients well. 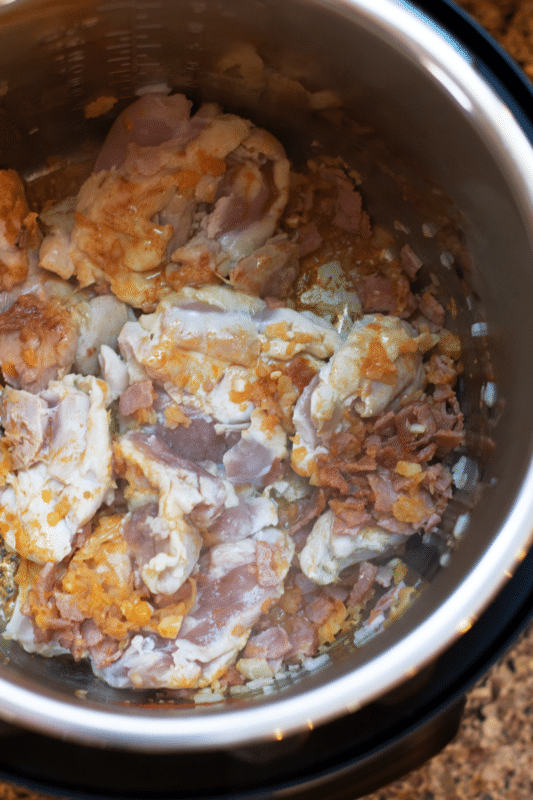 Place the chicken thighs back into the Instant Pot. Add in the fresh thyme springs and lock the lid to seal. Close the steam valve. Set your Instant Pot to the Poultry setting and set your timer to cook for 8 minutes if the chicken is thawed, 15 minutes if the chicken is frozen. 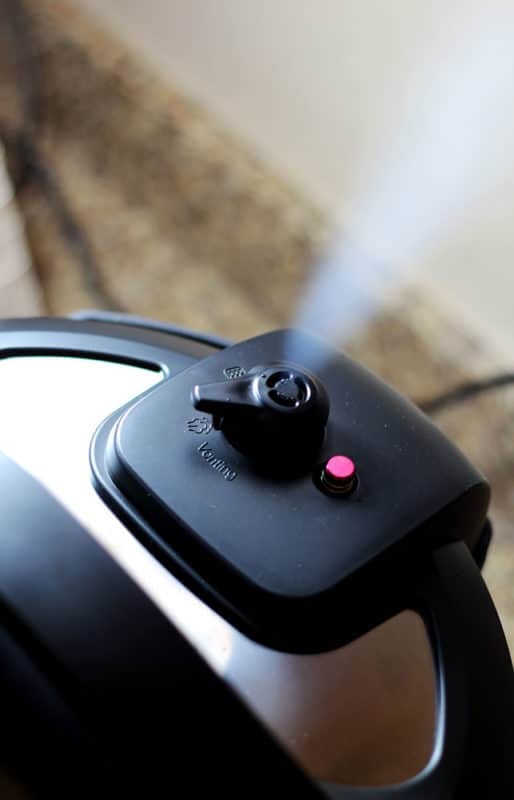 Note that during this cooking process, light steam will start escaping the Instant Pot. This is a normal part of the process. After the timer runs out, move the valve to release the pressure. Once the steam has stopped and it has completely depressurized, remove the chicken from the Instant Pot onto a plate. Set the Instant Pot back to Saute mode. Once The Instant Pot gets hot and the sauce starts to lightly boil, add 1 Tablespoon of Arrowroot or Cornstarch to 1 Tablespoon of water in a small bowl and mix well. Then, pour the liquid mixture into the Instant Pot and whisk until the sauce becomes thicker. Add the chicken back to the Instant Pot so the sauce covers the chicken and mix lightly to combine. 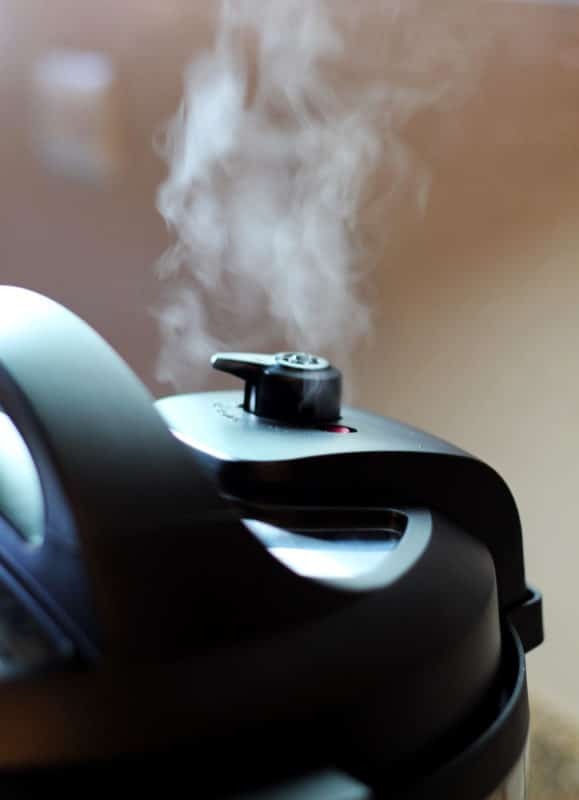 Turn Your Instant Pot off and you are now ready to serve. Store any leftovers in the refrigerator. Update Notes: This post was originally published in December of 2017, but was re-published with updated step-by-step instructions, pictures and tips in December of 2018. Thanks, Cynthia! Yes – Dijon Mustard is one of my favorite ingredients to cook with!! I’m not a fan of regular mustard either! So glad you loved this!! You’ll have to let me know how your friend likes it!! !